I checked the status of the rebate and it is looking good. Your rebate is valid and is scheduled for final processing. Please refer to your rebate form for estimated processing times. The Thermal Dynamics cart previously linked is listed for almost $300.00 on ebay. Last edited by N2 Welding; 11-01-2018 at 02:03 PM. ePay is a very efficient way for marketing to establish the best price point. Chinese vendors figured the technique out a few years back using multiple Buy it Now listings. Decided to make a few handles until I can get in and warranty the two broken ones .. Works well enough for me.. Isn't there a Comment section on Amazoom where buyers get to post their impression of the machine/toy they bought? If there is my hunch is replacement handles would be flying to buyers fast if appropriate comments were made regarding shipping damaged units and broken handles not really up to the task of surviving in the world. They should just ditch all the handles, and go back to the old school roll bar..
That said. I will be lifting most of the machines weight with the top handle only. This machine stays put though.. Yes there is a comment section, but doubt Thermal really cares what people think..If they cared, they would of s##t canned that whole setup. Need a cart? I had a few these years ago. and under $60.00 it is worth it.. The price really went up on the cart. Anyone know what that code means that comes up on startup? O3C3? Go to the 4.07 mark.. Had it linked to that time, but reverts back to the start. Last edited by Brand X; 11-04-2018 at 10:20 PM. Are you guys still having issues with code E012? I get it on both torches, called ESAB. they suggested taking it to my local LWS who will ship it to service center in Sacramento. I only had that issue when I had the Electrode damage in my torch. I have not tried to use the machine since the last time I was cutting the bat wings. I may have damaged the electrode by trying to clean it and scrape it with the tip of my pocket knife. I think that may have been an issue I was having with my electrode and the E012 code. Have you cleaned and inpected the start cartridge to make sure it is not damaged or sticking causing the fault. will remain low and the fault is set. moves freely. Try new parts. resistance the torch is faulty. “Some faults don’t set a code” to test the transducer and its harness. (pin 14) can set the E012. Remove both ends of the ribbon cable and check resistance from pin 13 to 14.
less than 0.01V. If higher the Inverter board may be faulty. f. Another possibility is the Control & Display board but the only way to tell is replace it. Last edited by N2 Welding; 11-06-2018 at 06:38 PM. I needed a right angle fitting for the air line to fit it on my cart. Found a nice swivel as Lowes for $8 and takes the strain off the machine attachment point. I noticed this when you posted it but did not say nothing at the time. I did not want to sound all preachy. The manual says not to use teflon tape as it could get into the plasma cutter and cause problems. Good point, and while you are at it.. try removing the angle flow restriction device.. You can use type if you are careful with it.Keep the tape back from the end of the threads, and no tape will get into the system. It's just getting carried away with the stuff. I generally this type of stuff, but not always.. This might be overkill on amount though.. I was not assuming you don't know what you are doing and that is why I did not say anything initially. Just pointing out an observation and that you might want to make sure you don't have any teflon tape on your unit before it goes in for repair diagnosis . 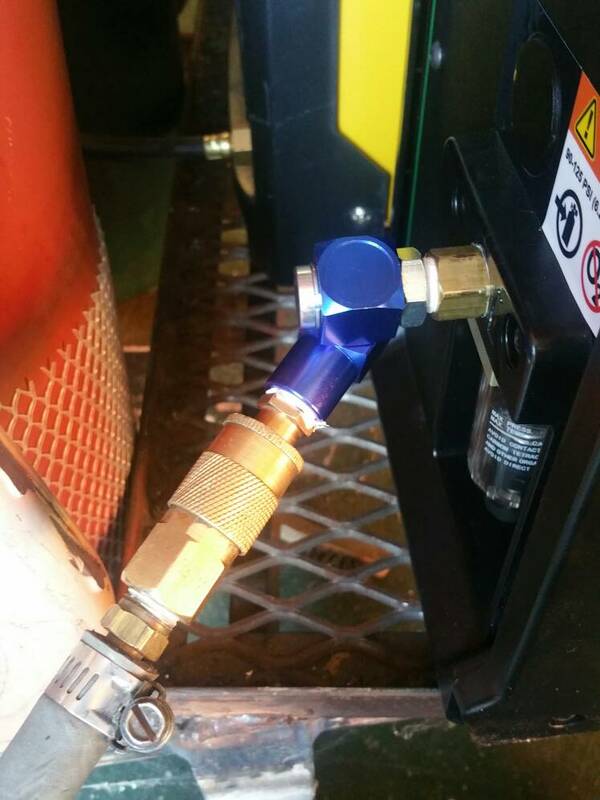 I had issues using the ESAB unit in my sig when I was doubling up on the regulated air from the compressor. 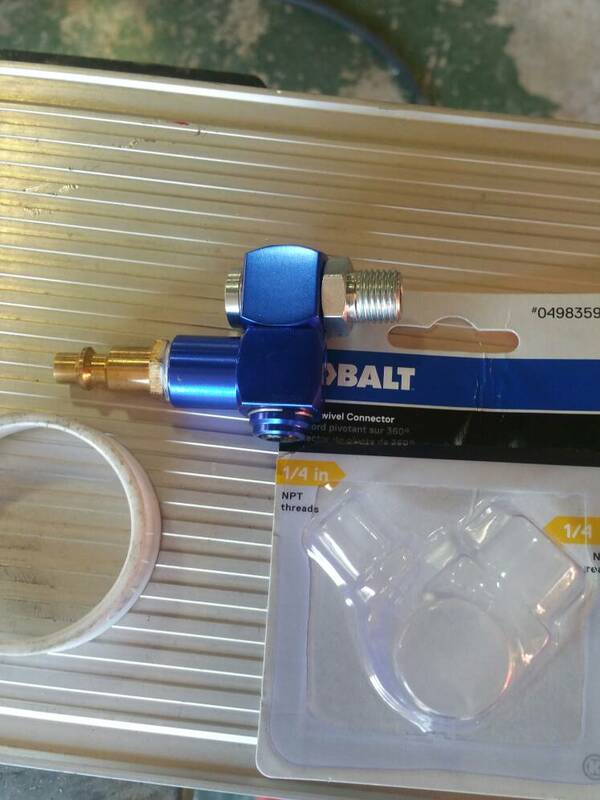 I was using one before getting to the units regulator/oil/water separator in addition using a 1/4 hose. I bypassed the regulator at the compressor and used 3/8" hose and that fixed the air supply issue. Last edited by N2 Welding; 11-06-2018 at 08:19 PM. Hey soutthpaw did you try the plasma with out the swivel and how do your consumables look? I didn't because I got that code even before I added the flex air coupler, I did clean out the starter as it felt a bit of friction sliding back and forth. Seems nice and smooth now. Haven't used it since cleaning. Still got the code, going to pick up a standard 90° elbow for the air. It only sends to happen on either first start up or new consumables. You running 125 psi at the machine? I am still waiting for the 10 nozzles from the UK ebay seller. Last edited by N2 Welding; 11-07-2018 at 08:06 PM. Once I spent some time with mine, first time plasma owner, I noticed that I was causing the plasma jet to go out. Once I noticed that I started doing a better job.